When American Movie came out in 1999, director Chris Smith said in an Indiewire interview that it was a one-time break from his feature-directing career: “It was a great experience, but I would not be interested in doing a documentary again because you lose sense of your personal life. It takes so much time and effort to do a documentary of this nature.” Smith met American Movie’s primary subject, Mark Borchardt, when they were both working on films at the University of Wisconsin-Milwaukee. Smith found Borchardt interesting enough that he decided to tag along on Borchardt’s trip to the Toronto International Film Festival, to film his attempts to raise money and interest for a film called Northwestern. Smith planned to turn the trip into a short movie about a Midwestern outsider trying to gain access to the film world. But the documentary ultimately wound up at feature-length (with the Toronto festival footage as one of the last things edited out), and it took Smith two intensive years to film, consuming his personal and family life. The result was a well-regarded film that won Sundance’s Grand Jury prize in the Documentary category, and has steadily grown in reputation over the past 15 years. Smith’s prediction that he was done with documentaries turned out to be wrong: His debut, American Job, was a feature film, and he’s written and directed one other narrative movie, 2007’s The Pool. But all his other films—2001’s Home Movie, 2003’s The Yes Men, and 2009’s Collapse—have been documentaries. Still, as he explained it when The Dissolve talked to him, as part of our Movie Of The Week coverage of American Movie, that isn’t as big a reversal as it might seem. The Dissolve: It’s been 15 years since American Movie first came out. How has it changed for you, looking back on it? Chris Smith: It’s funny—the film actually played in L.A. last August. I hadn’t seen it in quite some time. It was really interesting to look back on it, because I saw choices I’d made as a director that might be different than I would make today. They’re not necessarily better or worse, they’re just different. To me, that was the most interesting thing in looking back at the movie with perspective. The Dissolve: What kinds of choices? Smith: I could see that I changed as a filmmaker even during the production of that movie. The film was shot over a two-year period, and when I look back at it, I can see, stylistically, the beginning of the film is very different than the end. The way it was photographed changes as I learned how to shoot a movie, and even some of the ways I interacted with the people I was documenting changes. I think that allows you to get closer to them and have a more intimate experience. I feel like that was something I learned during that movie that has carried over to the work I’ve done since. So looking back, if I’d started that movie now, it would have been a very different experience. 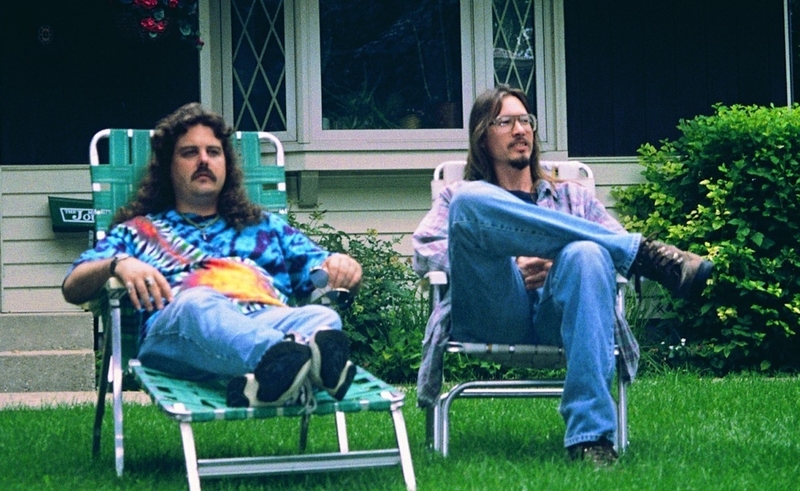 The Dissolve: Is part of that growing intimacy related to how your relationship with Mark Borchardt and Mike Schank developed over the course of two years? Smith: I think that definitely played into it. As you spend time with people and a level of trust is established, your access and your interactions with the people you’re filming changes. But I also think there’s something inherently in the process of filmmaking, and gaining experience, that changes the way you are able to go into a project like that. The Dissolve: Are you still in touch with them today? Smith: Yeah. Mark more so than Mike, just because I end up running into Mark more often. Every time I’m back in Milwaukee, I’ll usually see Mark. He was just out here in L.A. for the screening in August, so we spent some time together then. We talk on the phone every so often, just to keep up. The Dissolve: Do you have any sense for how the film plays for him today? Smith: I don’t. We never really talked about those sort of things. There are so many things about Mark that I find interesting, and his reaction to the movie isn’t necessarily one. I’m more interested in him and his life, and what he’s up to now. The Dissolve: He’s been working on a feature horror film for quite a while now, and the IMDB claims it’s coming out this year. Do you know anything about its status? Smith: Mark is very private about his films and what he’s doing, so I would love for you to talk to him, and he can give you any update he feels comfortable with. I love that we have a relationship, and that he talks to me about things, but it’s not something I feel comfortable about speaking for him. The Dissolve: Has there ever been any tension between you over your success, over the fact that you guys were both young filmmakers together 15 years ago, and you made a project about him that became a huge hit, while he’s still working on his second film? Smith: I haven’t felt any. I think if you watch the movie, and you understand who Mark is, I think you might understand why that might be the case. From my perspective, I’ve never felt anything from Mark in that regard, and I definitely don’t have any tension with him. But that’s a question I’d be curious to hear his thoughts on, if you were able to get a hold of him. The Dissolve: Given American Movie’s anniversary, and his work on a new film, have you ever been tempted to do a follow-up with him, a sequel? Smith: No. I like to move forward in terms of new territory. I think what I find most inspiring about filmmaking is exploring new subject matter, or worlds I’m not quite as familiar with. So I think, for me, doing a follow-up project is not as enticing. It just seems less creatively inspired. The Dissolve: In an interview just after the film came out, you said you’d never do another documentary, because they consume your personal life so much. But apart from The Pool in 2006, you’ve exclusively directed documentaries. How did you come back around on them? Smith: The documentaries I did after American Movie were very different. They weren’t these long, potentially endless, verité projects. They were confined. Home Movie was shot in 10 days, Collapse was shot over five days. So what I was attracted to was that they felt finite. Whereas knowing what went into making American Movie, that’s something I’m not terribly excited to go back and do at this point. The Dissolve: There are so many sequences in American Movie that feel like they could have been much longer and still been fascinating. And you’ve said you shot 70 hours of footage. What kind of choices did you have to make in editing? Smith: I think once DVDs started allowing you to put deleted scenes on, for me personally, it made the editing much easier, because you felt like all this great material still had a home. I agree, first cuts of a lot of the scenes did play a lot longer, and looking at them on their own, it was hard to figure out what could be cut down, or what we could lose. I think as you start to look at a movie as a whole, you start having to make those choices for the good of the overall project. The Dissolve: What was the primary reason you felt you had to make cuts? Smith: I think that the motivation was not commercial, it was purely just trying to make something that would be as engaging as it could be for an audience. For us, the challenge was always trying to take this sprawling story and make it as short as we felt like it could be without losing anything. The Dissolve: Does Sony still completely own the movie? The Dissolve: Do you have any say in how it’s marketed or released? Smith: No. I don’t really pay attention to those things. I’m just very excited about a lot of new projects, and that’s where a lot of my focus and energy is, so I haven’t really paid much attention to what they’re doing with the film. I feel like with any catalogue, the movies just end up in iTunes, or wherever they can be. I don’t know if they’ve actually done anything special, or more than they would with any of their library titles. The Dissolve: A lot of independent filmmakers really relate to the film, but Mark Borchardt has said he doesn’t like that—he doesn’t see himself as representative of anything, he just sees the film as his personal story. What’s your opinion? Smith: I never set out to make a movie about filmmaking. It was always a human story. I was attracted to Mark, and the struggles he had, and the dream he was trying to pursue. For me, that was always at the heart of what we were trying to film. That’s what I was attracted to immediately, not that Mark was trying to make a movie, but Mark as an individual, and his philosophical look at the world. He always impressed me and surprised me in the way he looked at things. His energy, enthusiasm, passion, and compassion felt so unique at that time, so it was something I was just very attracted to, in terms of seeing how that resonated through his life, and what he was trying to achieve. The Dissolve: At what point after meeting did you make the transition from “Let’s film this guy on a road trip to Toronto” to “Let’s shoot a full feature about him”? Smith: I think it was really trying to get a better sense of Mark’s world. On that trip, I met his mother, whom I found incredibly endearing. It was at that point that his world started to open up and become more interesting to me, to the point where it felt worth trying to see what else was there. I think when we got back to Milwaukee and met Mike Schank, and saw Mark trying to record this radio drama, it seemed like there was so much more to the story than I had seen just from meeting him and going on this trip. It just felt like at every turn, it kept unfolding in ways that seemed more and more complex and interesting, and that’s what I was looking for. Smith: I can’t comment on how other people will perceive the movie. For myself, it was a very different experience—I look at it, and it’s this document of two years of my life as well. I think my perspective on that movie is very different from anyone else’s, just because it brings back all these memories of a point in my life. What I take away from it will be very different from anyone else. The Dissolve: It was such a door-opener for you when it came out. How did it affect your career long-term? Smith: It’s definitely had a positive effect in terms of giving me opportunities, which were able to help me move on to other projects. I think it’s this way with any film. Because of American Job, I was able to go to a conference where I met Jim McKay, who ended up co-producing and financing American Movie with his partner, Michael Stipe. With any movie, you’re always moving forward in terms of the opportunities that are opened up for you. The Dissolve: Has there been any downside? Smith: No, I don’t think so. It’s hard to make any film, but the obstacles are not related to, in my opinion, any of the past work. It’s about solving problems in the work you are trying to do, presently. The Dissolve: When it was first released, people often asked if you were mocking Mike and Mark, and you said you showed it to them for their approval pre-release, because you were friends with them, and the most important thing was their comfort. Have you ever felt that kind of connection with the subjects of any of your other documentaries? Smith: Yeah, [the subjects of] The Yes Men definitely saw the movie before it was released, and we took any comments they had into strong consideration in terms of where the edit ended up. With Collapse, I showed the film to [subject] Michael Ruppert just to make sure he was comfortable with everything that was being presented. There’s a strong editorial process in any documentary, and I do believe, for me personally, there’s a responsibility to make sure that anyone being filmed feels accurately represented. With The Pool, the actors and the narrators, I believe, saw the movie before it came out, but it was a scripted project, so it wasn’t something I was as concerned about. In the other documentaries, that was something that happened. The only one that maybe wouldn’t have was Home Movie, because that was a very different type of project—I was hired to shoot that. It had a whole different trajectory. It wasn’t a project that I funded and did in the same way that the other movies were done. The Dissolve: How did that make the process different for you? Smith: That film was a little less personal. I only spent two days with each of the people that we filmed, so there wasn’t as much of a personal connection in terms of my interaction with the people in the movie. That had a production team on it, so there were other people who were in direct contact with the subjects of that film, where in Collapse, Yes Men, and American Movie, I was directly communicating with everyone throughout the whole process. The Dissolve: Do you get different things out of making your own documentary films, vs. making American Job or The Pool? Is your process different? Smith: No, they seemed very similar. I think ultimately, you’re trying to make something that has a connection with an audience, so whether it’s as a documentary or a narrative feels somewhat irrelevant to me. The Dissolve: Do you have any specific drive to do more narrative films vs. more documentaries? Smith: I would like to move more toward narrative. I started there, and always planned to work in that direction. There were certain documentary subjects that presented themselves, and at the time, it seemed like the best movie to make. It wasn’t always a conscious decision in terms of wanting to make a documentary at any given point, or wanting to make a narrative. It’s just trying to find the movie that seems the most interesting at that point and time. The Dissolve: What are you currently working on? Smith: I’ve been working on a number of scripts, and my hope is to try to make something that will be in keeping with the themes of what I’ve always been interested in, but that could possibly find a larger audience. I think that has been my focus over the last couple years, just in terms of trying to do something I haven’t done before. The Dissolve: What do you think of as the themes that most interest you? Smith: I work a lot on instinct. I have to go off what seems interesting to me at the time. I think because these ideas are being generated by the things I’m interested in, of course there will be themes and similarities, but they’re very much based around what feels inspiring to me at that moment in time. I think, with the current projects I’m working on, they’re just different stories about characters that go on journeys that reveal. The Dissolve: One of the things that seems to unite your films is the outsider perspective. It’s a long way from American Movie to The Pool, but they’re both about people who are outside the mainstream, and have a driving ambition that keeps them going. Smith: I think those are characters and stories I’ll always be attracted to, but they’re not at the base of my thought process when trying to think of ideas. I think I find myself being inspired by a character in a situation, and trying to imagine how that could unfold in ways that could then have resonance and meaning for people that are watching the film. I agree with everything you said, I think those things are present, and I think they always will be, in terms of the things I’m attracted to. I’m not going out and trying to always stay on this one track of outsider stories. The Dissolve: I’ve always been curious about something in American Movie: There’s a huge turnout for the “Coven” première—the line to buy tickets is around the block, and you said on the commentary track that you had to turn more than 75 people away. Mark feels so isolated through much of the movie, but in that moment, it feels like there must have been some kind of outside awareness of him, or of your project. Why was there so much interest in this 40-minute indie horror feature? Smith: Milwaukee is a very supportive community. I think there were a lot of screenings like that. And a lot of times, you would get big turnouts just because people are enthusiastic about local filmmaking and local productions. Mark, over the course of two years, had a lot of people involved in the movie, so I think that there was a lot of community support for him in that way. The Dissolve: Back when the film came out, you often said that Mike and Mark interested you so much because they’re so open, they aren’t positioning themselves, or trying to sell an artificial narrative. It’s hard to imagine people behaving this way now, when reality TV have made people so aware of how they’re branding and selling themselves. Do you think this movie could have been made today? Smith: I think this movie would have been very different today. I think there’s much more self-awareness in terms of people’s interaction with cameras and knowing where that ends up in terms of reality programs. What we would have captured would have been very different just in terms of self awareness. I think that it definitely was a product of that time in the best possible way. I just feel really lucky that we were able to spend that time together and end up with something that people are still talking about 15 years later. This concludes our Movie Of The Week discussion on American Movie. Don’t miss Tuesday’s Keynote on the redemptive power of a driving goal, and Wednesday’s staff Forum discussion on the film’s subjects, from their best aspects to their worst. Next week, in honor of Wes Anderson’s new film The Grand Budapest Hotel, our Movie Of The Week discussion will focus on his film The Royal Tenenbaums.